Lately I have not had the urge to write on a regular basis. It’s not that my life is dull or I have suddenly lost all my opinions. No, it is because of something much simpler. I simply stopped. To be honest though, I miss it. I miss the creative outlet. I miss the consistency that resulted from it. I miss the ability to process what I’m going through on a regular basis. Most of all, writing brings me a good deal of comfort and I miss that. I don’t know if I’ll ever aspire to the angst filled writing of Hemingway, seeking the one true word or sentence or chapter. That is simply too torturous for me. I find myself varying between the stream of consciousness posts, while other times I simply cut my finger and bleed on the page. Either way, I find a place of refuge in the written word. I think that’s why I write. I write for the same reason why I run—it brings freedom and a measure of hope. I write because it feels good after I have a completed a page (or mile) or two. I write because it brings joy and fullness. 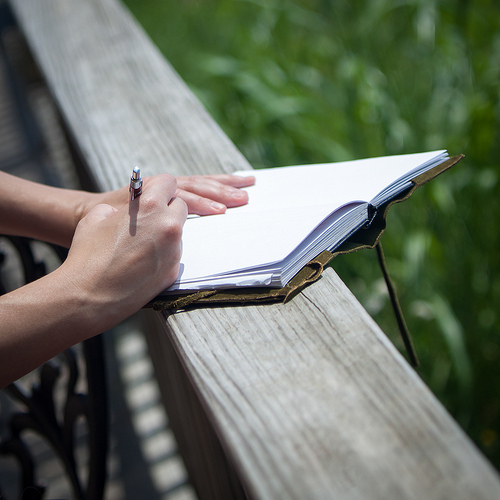 I write because it is a place I can inhale and exhale, working out frustrations with a mild dose of lucidity. To be dramatic, I write so that I can be free.